To further explain PTSD resulting from terrorism and other traumas, we have just discussed four losses trauma survivors may face. 1. Loss of their feeling of invulnerability. 2. Loss of an orderly world. 3. Loss of a positive self-image. Now, let's look at the role that prior experience and training make in a predisposition to PTSD resulting from terrorist attacks. Two factors that affect the individualized response to the stressor of terrorism: first, life experiences before the incident, and second, the behavioral response repertoire that the victim brings to it. As I am outlining these, think about clients you are treating or have treated and ask yourself if any fit into these categories. The first factor is the role that prior training plays. 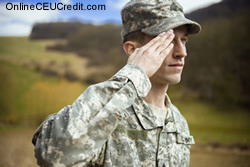 Some individuals, such as military or diplomatic personnel, may have had prior training that enables them to mobilize a wide range of conscious adaptive behaviors in addition to unconscious defense mechanisms that affect their response to the stressor of terrorism. Presumably, they might have better adaptive advantages in a terrorist situation compared with individuals who have had little or no prior experience. For example, one contributor to the relatively low level of psychopathology manifested by the American hostages in Iran was their prior experiences and training in the foreign service and military fields. Ask yourself, are any of your current clients military or diplomatic personnel with training regarding terrorism? Secondly, personality type is another important factor which determines coping behaviors. Studies of prisoners of war and concentration camp survivors have shown that certain personality types adapt more successfully than others under identical circumstances. As an example, Ford and Spaulding psychiatrically evaluated the 82 surviving USS Pueblo crew members who were captured and imprisoned in North Korea for 11 months in 1968. Those men who adapted poorly to the prolonged stress were frequently evaluated as being passive-dependent, whereas those who coped well with the stress most often had personality diagnoses of healthy or schizoid. 3. We are a good and strong people. Thus, others will not attack us. As a nation we all had these basic assumptions shattered at a certain level in the same way that direct victims of the attacks questioned these assumptions. The professional code of ethics emphasizes self awareness...ask yourself where are you personally regarding personal invulnerability, feeling the world is orderly, and that we are a good and strong people not a target for an attack. To what extent has your shattered assumptions affected your treatment of clients? Or has it affected your treatment of clients? QUESTION 3: What are three assumptions about ourselves that we as a nation have been forced to reconsider? To select and enter your answer go to Answer Booklet.